A palatable and healthy omelet that is just a perfect breakfast or brunch combo! This recipe is such that anyone can tweak and adjust the ingredients according to one's taste. It is so interesting that whichever way you decide to prepare omelet, it usually comes out very well and delicious. Currently this breakfast omelet has been on the list of my desirable recipes to share and I am glad that I am doing so now. Spiced with diced onions and peppers, I also garnished it with some leafy vegetables such as; baby leaf spinach, lollo rosso, apollo, lamb’s lettuce and red multileaf. 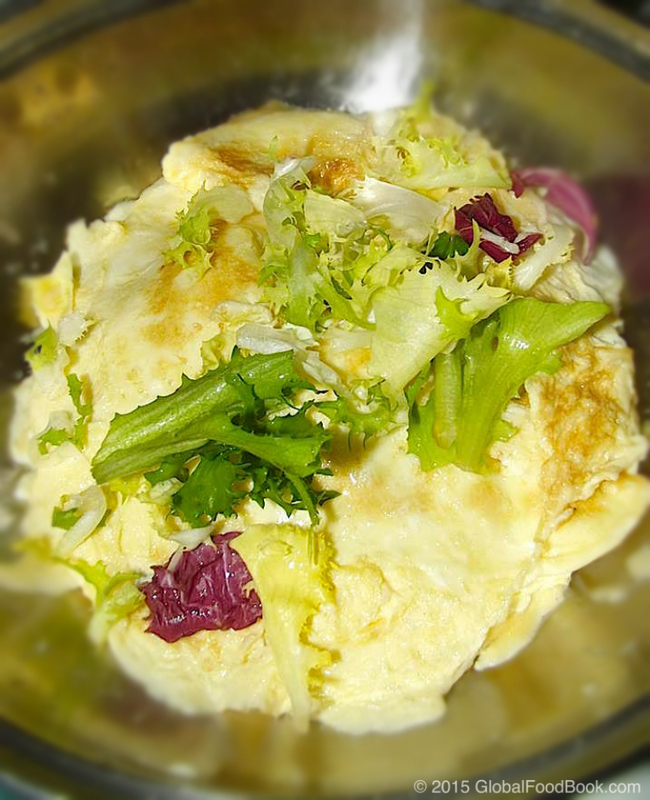 Believe me, I am so loving this vegetable omelet dish because it was on the healthier side as the numerous vegetables added are filled with vitamins and nutrients. Oh, absolutely, this vegetable omelet tastes perfectly good too and I bet you too will enjoy it. This recipe meets my requirements of a healthy breakfast because I love the fact that they are full of fresh veggies. Vegetables and omelete perfectly complement each other and the nutritional value are of great importance to human health. Egg is an excellent source of calcium, vitamins A, iron, selenium, vitamins B-12, Vitamin B-6, vitamin D and protein. The leafy vegetables are also an excellent source of magnesium, vitamin C, iron, calcium, dietary fiber and vitamin A... So you can see why this meal is such an healthy one. Break the eggs in a clean bowl, add in the onions, pepper and salt to taste. Then whisk properly and set aside. Also wash the lamb’s lettuce, apollo, red multileaf, baby leaf spinach and lollo rosso with salt and clean water before adding in a sieve to drain excess water. Meanwhile slightly heat up the vegetable oil in a saucepan on a low heat. Pour in the whisked egg mixture and allow to fry for at least 2 minutes. Then use a wok spatula to turn the omelet over the opposite side so that both sides can fry properly. 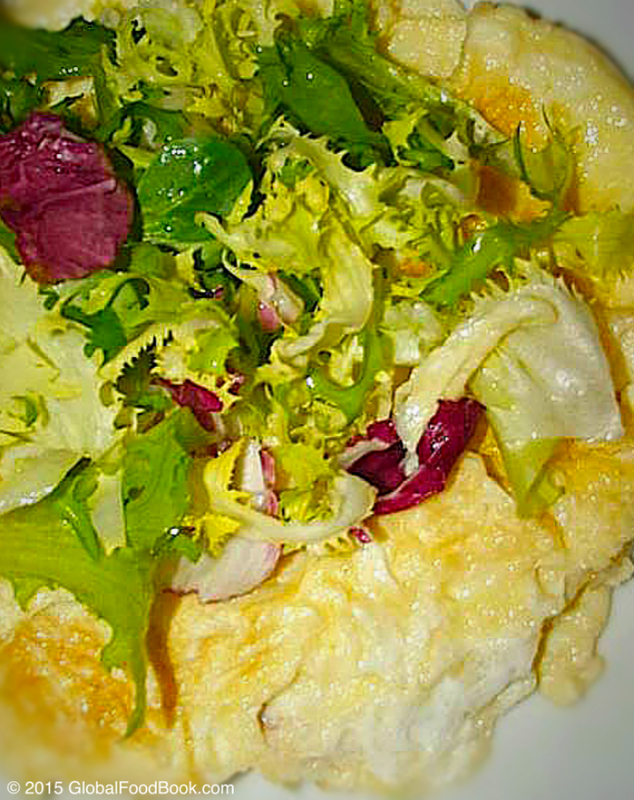 Once the omelet is cooked, scoop out from the saucepan then serve garnished with the vegetables.